Every town administrator needs to record Board votes with speed and accuracy. The OptionPower Council Voting Module helps boards and legislative bodies accelerate their deliberations with electronic polling. This advanced tool gathers, tabulates, and immediately displays votes from individual representatives using handheld keypads or tablets. Every representative is accountable to constituents. 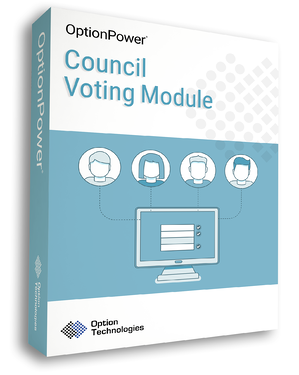 Option Technologies developed the Council Voting Module to foster that accountability. The tool records and displays the vote of each representative on each item of business. Staff members easily create voting slides showing the title of each proposal or motion. Council members use their device to vote. The module’s flexibile display can be configured to show who voted, how they voted, vote totals, and whether the item was adopted or rejected. The Council Voting Module helps legislatures, city councils and association boards tabulate and display voting results quickly and easily. It works with a variety of OptionFinder® wireless audience response keypad hardware as well as iPads and tablets. Show individual names, districts or precincts along with the individual vote cast (Yes/No/Abstain). The voter display changes manually or on a time interval cycle to display results from an unlimited number of individual voting representatives. Shows total votes cast both live and after polling closes. Display can be configured to show result labels (Yes/No/Abstain) and colored indicators matching the preference or voting procedures. Tabulates and displays the results of a vote (Pass/Fail) based on weighted formulas or majority thresholds.